iPhone Photography School has partnered up with Momentage photo sharing app to bring you a unique photo contest with great prizes. 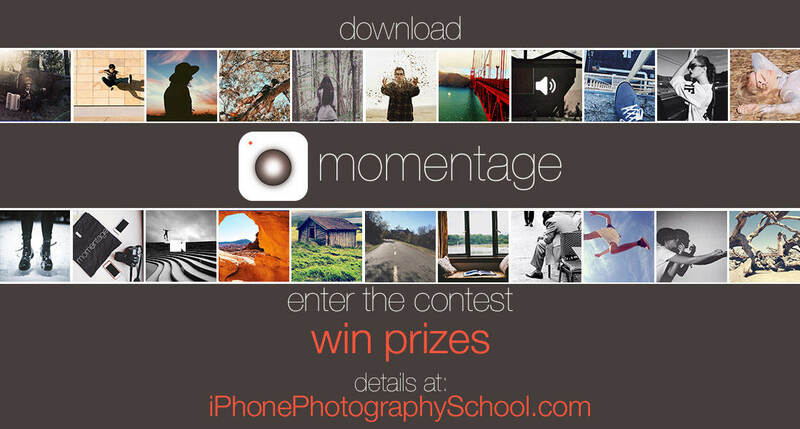 The three winners will get $20 App Store gift card and an awesome t-shirt from Momentage, while many more will be featured on iPhone Photography School and inside Momentage. Read this post to find out more. Momentage, a community for the new creatives, is joining individuals from around the world through their mobile app where users combine photos, videos and SoundImages™ into a single post to create a vivid storytelling “Moment”. These Moments can be richly expressed through users being able to edit, add to and rearrange media with a unique style and inventive technique. The community can share Moments publicly, with a customized group or keep privately for themselves. Users have more power over their privacy of each post with Momentage than with any other app. Momentage enables users to share their work with current followers as well as connect with new ones and receive positive comments. This new global community appreciates life’s most meaningful moments through an artistically designed series. The authors of my three favorite Moments will receive $20 App Store gift card and a cool t-shirt from Momentage. The winners (and many more great Moments) will be featured on iPhone Photography School and in Momentage app. The submission deadline is Wednesday, February 26. The winners will be announced on iPhone Photography School by Friday, February 28. You can find me and see my Moments by searching for “iphoneps” on Momentage.